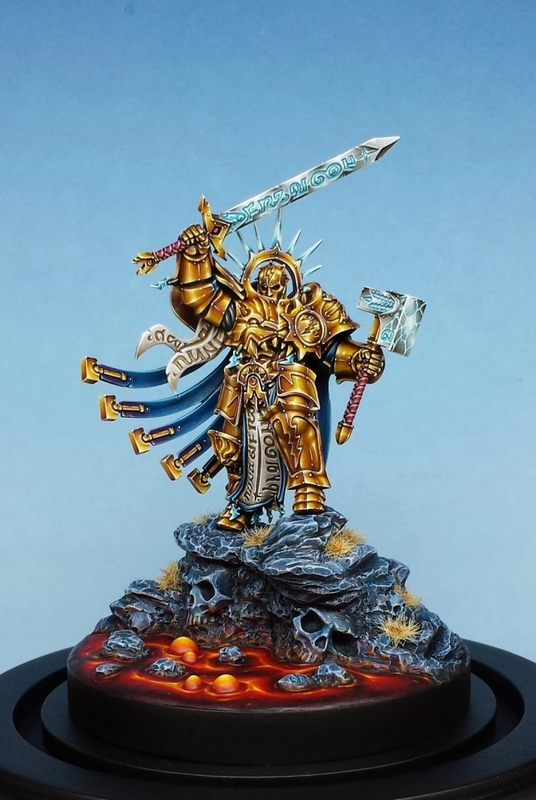 How could this amazing miniature not be the Mini of the Week? I have been following Darren's progress on this mini on twitter eagerly. For those of you who don't know, Darren Latham is a miniature designer at GW, but was formerly a member of the 'Eavy Metal team throughout almost the entire 2000s. His style is the very definition of 'Eavy Metal crispness. 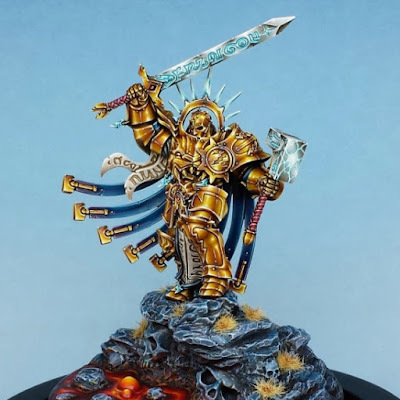 I don't even know what to say about this model, everything on it is perfect. The Non-Metallic Metal is spot on, with every reflection and shadow placed exactly where it should be. The gold is also a nice, rich and warm color. I really like the mystical light and lightning effects on the weapons, they add a nice little extra touch. The base is fantastic as well. It's super characterful and fitting for the high fantasy mortal realms. The lava is nice and bright, with just the right amount of Object Source Lighting on the rocks. The fact that there are skull faces carved into the rocks he is standing on is a perfect fit for the ever skull friendly worlds of Warhammer. I really don't know what else to say, this model is just perfect, no questions. Great job Mr. Latham! I'm looking forward to seeing some more AoS stuff from you in the future hopefully. Be sure to check out more views of it on Putty and Paint, and show the artist some love if you like it.